Gregory William Weingart, 61 years, passed away September 15, 2018. He was born on June 20, 1957 to Richard and Janet Weingart (Spies) in St. Louis, Missouri. Greg was a graduate of Pattonville High School in St. Louis, Missouri, Class of 1975. He worked in elevator construction and was a proud member of The International Union of Elevator Constructors. He began his career with Local #3 in St. Louis, Missouri and finished with Local #15 in Milwaukee, Wisconsin. Greg will be missed by his wife Shelly Weingart (Pagach), children Daniel (Bridget) Weingart, Niza Volair, Lindsay (Jesse) Herzfeldt, Shay Weingart, Kasey Weingart, and Connor Weingart, grandchildren Dylan, Grant, and Jace, siblings Russ (Dianne) Weingart, Chris (Julia) Weingart and Lynn (Dwight) Johnson, brother-in-law Matt Pagach and special friends Robert “Boston” Dean and Greg Wunderli. Further survived by nieces, nephews, other relatives and friends. Preceded in death by his parents and son Lucas. 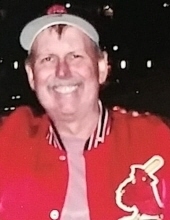 Greg was a life-long St. Louis Cardinals fan and enjoyed following the Green Bay Packers. Greg chose not to have a formal service and we will be having a gathering to celebrate Greg’s life at a later date. To plant a tree in memory of Greg W. Weingart, please visit our Tribute Store. "Email Address" would like to share the life celebration of Greg W. Weingart. Click on the "link" to go to share a favorite memory or leave a condolence message for the family.